The game started out with what could have been a routine out. 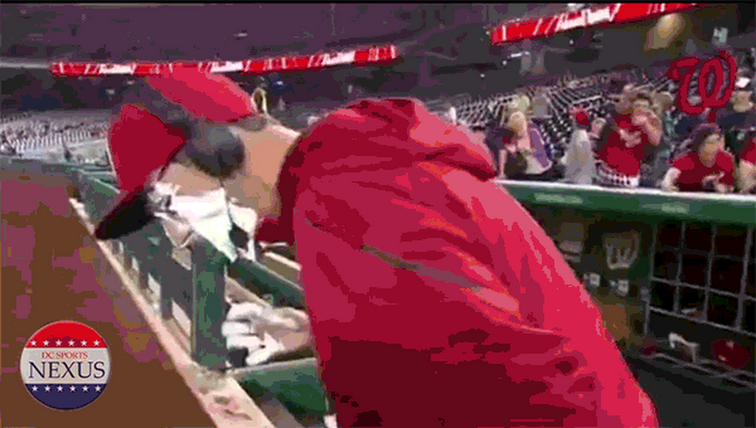 But it turned into a double as the popup fell right in a hole while 3 different Nats fielders looked at each other wondering why the other hadn't caught it. That play pretty much summed up the game to follow and the Nationals lost to the Padres 6-1 on Tuesday afternoon at Nats Park. 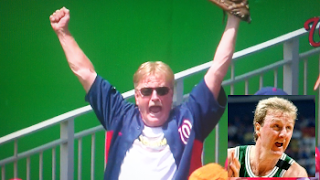 Larry Bird Look-a-like caught Harper's HR? FP Santangelo Thinks So! Just six batters in the rain was coming down so loud you could hear it on TV. There was a brief 8 minute rain delay, something I've never seen before. At that point the Dre's were already up 1-0 and had the bases loaded. When Strasburg returned to the mound and finally got out of the inning, it was 3-0 Padres and Strasburg had thrown over 35 pitches. I'm not sure if the rainy start was Strasburg's undoing, but he was off all day, even when the sun came out, after a previous start where he struckout 13 batters. Steven gave up 7 hits, 4 earned runs, walked 2, and struckout 5 over 84 pitches in just 4 innings of work. Gorzelanny came in and helped the bullpen out by eating up 3 innings (as well getting a hit, now 2-2 batting 1.000). Meanwhile, the Padres got 8 innings of 5 hits and 1 run with 7 strikeouts by their starter Anthony Bass. Final pitch count Padres 109, Nationals 166. Cray. The Nats offense went back into hibernation mode, the highlight being Bryce Harper's 2nd Major League homerun, another shot to center field. Desmond had 2 hits as well. The game ended with Bryce Harper striking out on a 101mph fastball by Andrew Cashner.